From left, Moffat County shooters Hunter Rummel, 16, Dakota Lee, 18, and Dylan Villa, 18, display the windows and targets of the shooting range at Bears Ears Sportsman Club. The three of them, as well as Travis Walsh, competed and finished highly in the National 4-H Shooting Sports Invitational, which included gun and archery events. — Lee and Villa also competed with a Colorado team that placed 3rd overall. — Rummel also competed with a Colorado team that placed 10th overall. — Walsh also competed with a Colorado team that placed 2nd overall. Dakota Lee has been a shooter for as long as she could hold a gun, and she always will be. Even if she won’t be participating in the activity in the same way from this point on, she can hold her head up that she made her mark among her peers. 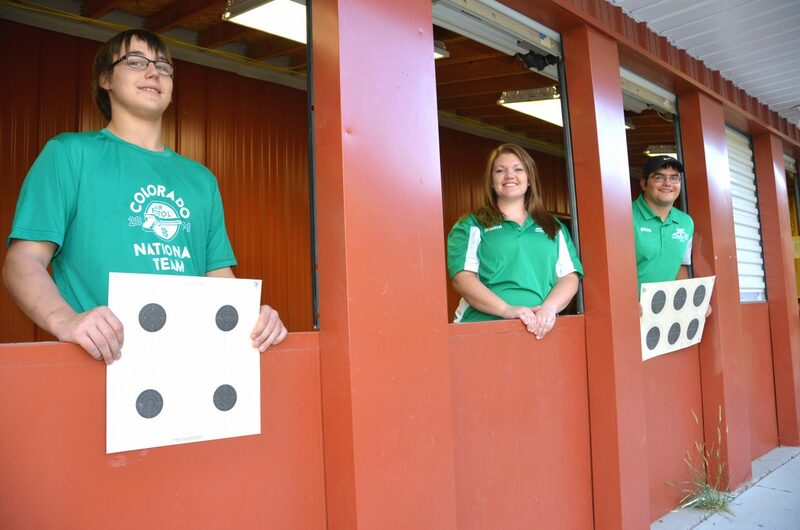 Lee was one of four teenagers from Moffat County to attend the National 4-H Shooting Sports Invitational in late June in Grand Island, Nebraska. Lee, Dylan Villa, Hunter Rummel and Travis Walsh represented Northwest Colorado strongly with high individual and team finishes in gun and archery competitions. Lee and Villa, both 18, shot in the small bore rifle category, gaining eighth and 10th place finishes, respectively, as well as a third-place team finish when combined with two other Colorado marksmen. Although both have years of experience under their belts, going into competition against certain contenders was intimidating. Nevertheless, the atmosphere was friendly, and they were quick to bond with other high-caliber shooting enthusiasts from across the country. “I don’t think I’d ever be able to meet people like that anywhere else,” Villa said. Although she was far from the only female shooter at the national level, Lee took a certain amount of pride in being a girl among a lot of boys. “You don’t see a lot of girls, and so many girls don’t know how powerful they could be in this,” she said. Elsewhere, Walsh placed 51st using a compound bow, with the Colorado archers with whom he was matched taking second overall. Rummel’s specialty was the air pistol, taking 17th place in the nation individually and his team, 10th. Rummel, 16, said he plans to build on his current standing, the competition being his first time reaching the national level. Rummel added that the amount of gun skill within Moffat County also pushes him to be better. Both he and Villa are eligible to compete in the state competition later this summer, though this time they’ll both be entered in the air rifle bracket. Time will tell if they make the cut for next year’s national contest, with local 4-H still determining who will move on to higher levels. Lee and Walsh each have aged out of further competition in 4-H shooting, though this will hardly be the end of the line for them as far as shooting and archery goes. Lee, who said the amount of support from Moffat County was outstanding, hopes to be able to mentor younger shooters, as does Villa, who stated that kids with the potential for greatness in their future can benefit from what he and his teammates have been able to accomplish.